Man of Steel doesn't come out until next summer and we still have very few details about the film as it is. There are two teasers that played this summer with The Dark Knight Rises and there are a handful of photos but other than that, we know very little. One detail that has kept our interest piqued is the lovely Amy Adams as Lois Lane. From what we've seen, her appearance hasn't been altered much for the role of Superman's love interest. In an interview with Yahoo! Movies, they noted that she's completed flming on Man of Steel and how Lois Lane is another extension of 'broud shouldered' female characters that she has played. Adams replied, "Absolutely. It was fun. It was intimidating because it was played before by Margot Kidder, whom I love. One of my favorite movies growing up was "Superman" -- and "Superman 2." I was kind of a nerd; I loved them so much. It was important to create a character that was new because I thought she was perfect. It's hard to step into a role where you thought someone had already achieved what could be achieved. But coming from theater, you're always stepping into a role that's been done before, so you're always excited about it." Talking to USA Today, Adams points out she never had any intention of recreating someone else's character. She said, "This was a new idea, down to the hair color. I knew people would want to talk about my hair color. It was going to be a thing. (Director) Zack (Snyder) told me he didn't hire me to play someone else. He hired me to play Lois Lane. It's a whole reimagining." When asked what it is she made 'new' for the character, she added, "It's a totally different realization of the Superman lore, so I felt free in that way because I wasn't trying to emulate any sort of banter that had been established by Christopher Reeve and Kidder. I was given a lot of permission to create a new character." Adams also notes that Margot Kidder's portrayal of the character affected her as a young woman and she hopes she can do the same thing, "I grew up really loving(her). I wasn't trying to be her but I hope I do enough of a good job to have the same effect on young girls as Lois Lane had on me. I really loved seeing a woman represented as a modern woman in a superhero movie, and not even glamourized, really -- she was kind of a troublemaker. She wasn't a typical heroine. I identified with her from a very young age." Though as far as the final product goes Adams hasn't seen anything, "I haven't seen it. I haven't seen any footage. It's intense. Henry worked his tail off as Superman. It's different for me. A lot of running. I hold a laser taser of some sort." Man of Steel opens in theaters on June 14, 2013 release. Few details are really known about Zack Snyder's upcoming Man of Steel except that it of course has Superman and that he will be fighting General Zod in the film. But what if there was a secret villain in the film that no one had mentioned? The cat might be out of the bag now. Since most of these sets are somehow tied into the upcoming and previously released films of these respective characters, it stands to reason that Black Zero will appear in Man of Steel. Why else would such a random character be chosen for a LEGO set? 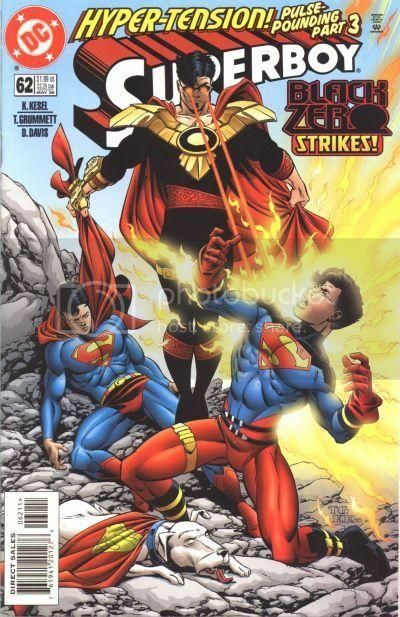 Black Zero first appeared in a Superman comic titled "The Man Who Destroyed Krypton," wherein he revealed to Superman that he was paid to destroy his home planet of Krypton. Will the character make the leap to the big screen for the new film? Or was this simply a creative choice by LEGO because they're big fans of the character? Time will tell, but check back here for any more updates. Henry Cavill plays Superman in the June 14, 2013 release. Amy Adams stars as Daily Planet journalist Lois Lane, and Laurence Fishburne as her editor-in-chief, Perry White. Starring as Clark Kent's adoptive parents, Martha and Jonathan Kent, are Diane Lane and Kevin Costner. Badtaste.it was at the Rome Fiction Fest where writer/director David S. Goyer was presenting his new series "Da Vinci's Demons." During the Q&A for his new series, the subject turned to writing Man of Steel and how it compares to his other works and Goyer was happy to elaborate. Moderator: You are quite good at writing two kinds of stories: fantasy completely original stories, with a supernatural aspect, and also adaptations (especially from comic-books) that you reinvent in an original way. We know you're working on a new comic-book adaptation, a DC Comics adaptation. What does this work have in common with you previous works? David Goyer: Are we talking about Man of Steel? What Christopher Nolan and I have done with Superman is trying to bring the same naturalistic approach that we used adopted for the Batman trilogy. We always had a naturalistic approach, we want out stories to be rooted in reality, like they could happen in the same world we live in. It's not that easy with Superman, and actually this doesn't necessarily mean we will make a dark movie. But working on this reboot we are thinking about what would happen if a story like this one actually happened. How would people react to this? What impact would have the presence of Superman in the real world? What I really like to do is writing "genre" stories without a cartoonish element. I did the same with Da Vinci's Demons, and I'll do the same with Man of Steel. It's no secret that everyone involved in the production of next summer's Man of Steel is not saying much about the movie. We've gotten a handful of quotes about the movie, but nothing that goes into extensive detail. Another thing we don't know is whether star Henry Cavill will be portraying the character in the proposed Justice League film, but are there already plans for a Man of Steel sequel? In an interview with E!, director Zack Snyder danced around the question: "We like to take it one step at a time and not curse anything. It's that kind of thing so we'll see what happens." Time will tell, but with a tentpole film like this, there's no doubt that WB is mulling over its future prospects. Details are few on the precise nature of Michael Shannon's General Zod in next summer's Man of Steel to the point that, at Comic-Con earlier this year, director Zack Snyder refused to even confirm Zod as the villain. Today, VH1 has made a small chink in the film's armor of secrecy, learning that the actor won't deliver the famous, "Kneel Before Zod!" line from Superman II. "I don't say that in the movie," he admits at the tail end of a gag segment on "Big Morning Buzz Live." In the past, Snyder has stressed that his vision for Man of Steel is one created as though no previous Superman films exist. Although "Kneel Before Zod!" has since made its way to the comics, the line was not a character catchphrase prior to Terence Stamp's performance. There's also the possibility that the line is included in the film but is delivered by another character, such as Antje Traue's Faora or that, as in many comic book films, the line is delivered by someone else as a joke, poking fun at its familiarity. Man of Steel also stars Henry Cavill, Amy Adams, Laurence Fishburne, Diane Lane, Kevin Costner, Ayelet Zurer, Russell Crowe, Harry Lennix and Christopher Meloni. The film hits theaters on June 14, 2013. With Warner Bros. re-releasing Zack Snyder's "Ultimate Cut" of his 2009 Watchmen on Blu-ray this week, the filmmaker spoke with The LA Times about his fondness for comic books in general and offered a brief update on next summer's Superman reboot, Man of Steel. "It's a more serious version of Superman," he says. "It’s not like a heart attack. We took the mythology seriously. We take him as a character seriously. I believe the movie would appeal to anyone. I think that you’re going to see a Superman you’ve never seen before. We approached it as though no other films had been made. He’s the king-daddy. Honestly that’s why I wanted to do it. I’m interested in Superman because he’s the father of all superheroes. He’s this amazing ambassador for all superheroes. What was it about him that cracked the code that made pop culture embrace this other mythology? What we‘ve made as a film not only examines that but is also an amazing adventure story. It’s been an honor to work on. As a comic book fan, Superman is like the Rosetta Stone of all superheroes. I wanted to be sure the movie treated it respectfully." Speculation began last week that we'd be seeing trailers for Man of Steel and The Wolverine in a few weeks with Peter Jackson's The Hobbit: An Unexpected Journey. Earlier today, director James Mangold said there wouldn't be a trailer for The Wolverine yet, but now director Zack Snyder says there WILL be a trailer for the Superman movie (via MTV). "It's fun. I can't wait for 'The Hobbit,' so it will be fun to see our crazy 'Man of Steel' trailer and then enjoy the Hobbit because that's going to be great," said Snyder. "It just feels like a fun Christmas thing to do, drag the whole family out for that action." He also teased the performance of Michael Shannon as General Zod. "I was just incredibly fortunate to play with those guys who really were giving all they had to bring a level of commitment to the scenes they have together so that audiences will get an opportunity to really have their heroes taken seriously. As serious as I was taking it, and I don't mean that from a depressing kind of way but from a, 'This is important and fun and needs to be given the respect that it deserves,' from that perspective it was so exciting to watch them drink the Kool-Aid of that concept and go all the way." Snyder is well into the post-production for the film and is nothing but enthusiastic about it: "I'm super psyched. It's really fun. I have no superhero fatigue." Man of Steel will be presented in 3D, 2D, and IMAX and is slated for release on June 14, 2013. Author Greg Cox's novelization of director Zack Snyder's Man of Steel is already available for pre-order at Amazon! The book will be available on June 14, 2013 (the same date as the film's release). Greg Cox is the New York Times best-selling author of The Dark Knight Rises novelization. He has also written successful novelizations and tie-ins for Star Trek, Countdown, Infinite Crisis and many more. The film, from director Zack Snyder, stars Henry Cavill (The Tudors) as Superman/Clark Kent, three-time Oscar® nominee Amy Adams (The Fighter) as Daily Planet journalist Lois Lane, and Oscar® nominee Laurence Fishburne (What's Love Got to Do with It) as her editor-in-chief, Perry White. Starring as Clark Kent's adoptive parents, Martha and Jonathan Kent, are Oscar® nominee Diane Lane (Unfaithful) and Academy Award® winner Kevin Costner (Dances with Wolves). You can pre-order the novelization at Amazon. 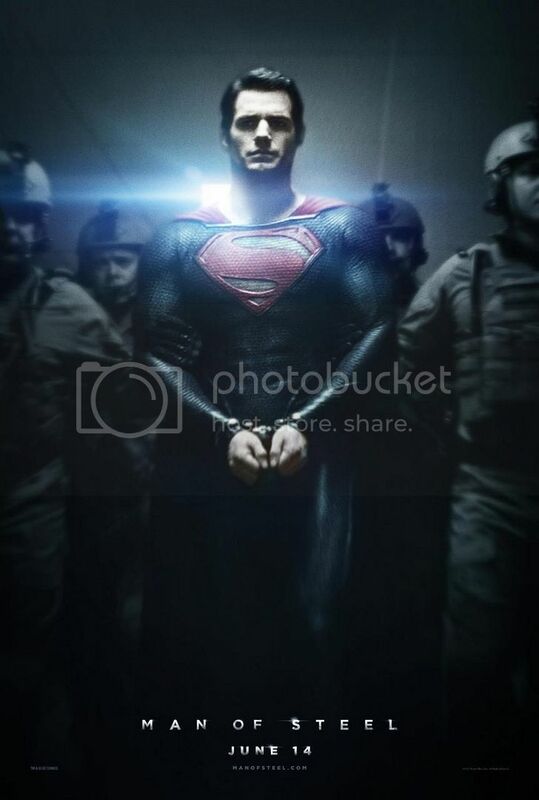 The New Man of Steel Poster is Here! Two weeks ago, Warner Bros. put up the promise of an Exclusive Reward from Man of Steel in conjunction with the home video release of The Dark Knight Rises and it's finally here. Below you'll find the brand-new poster for the film! Henry Cavill plays Superman in director Zack Snyder's Man of Steel. The film also stars Amy Adams as Daily Planet journalist Lois Lane, and Laurence Fishburne as her editor-in-chief, Perry White. Starring as Clark Kent's adoptive parents, Martha and Jonathan Kent, are Diane Lane and Kevin Costner. Man of Steel is coming to 3D, 2D and IMAX 3D theaters on June 14. 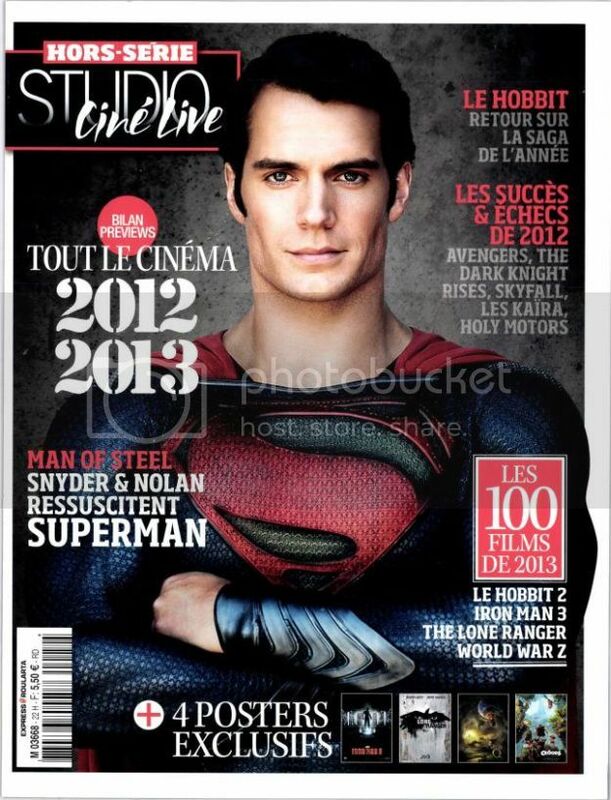 Henry Cavill has landed on the cover of Studio Ciné Live magazine in his Superman outfit. The cover made its way online today and you can check it out below! The viral campaign for next summer's Man of Steel appears to have officially launched with The DSRW Project, an ARG that purports to research deep space radio waves. All day, fans have been hard at work decoding incoming signals that bear more than a passing resemblance to Kryptonian characters, ultimately revealing a secret site that appears to offer some form of extraterrestrial countdown. What it's counting down to, however, remains to be seen. Last year, Warner Bros. debuted a similarly SETI-inspired viral site for Green Lantern, another DC Comics property. Directed by Zack Snyder, Man of Steel stars Henry Cavill, Amy Adams, Michael Shannon, Laurence Fishburne, Diane Lane, Kevin Costner, Antje Traue, Ayelet Zurer, Russell Crowe, Harry Lennix and Christopher Meloni. It arrives in theaters everywhere June 14, 2013. Of all the superhero movies coming out in the next year or so, this one concerns me the most. Not because anything I've seen makes me think it's going to be bad, but because it seems like this one HAS to succeed in order for Justice League to really make it. I hope it does, but I'm still nervous.